One of the most gratifying things as a teacher is that moment when your students’ eyes light up and you can see their creative juices churning. Well that was a moment repeated many times over the past few weeks as a group of eager sewers and quilters attended our Art Quilt Intro Series. 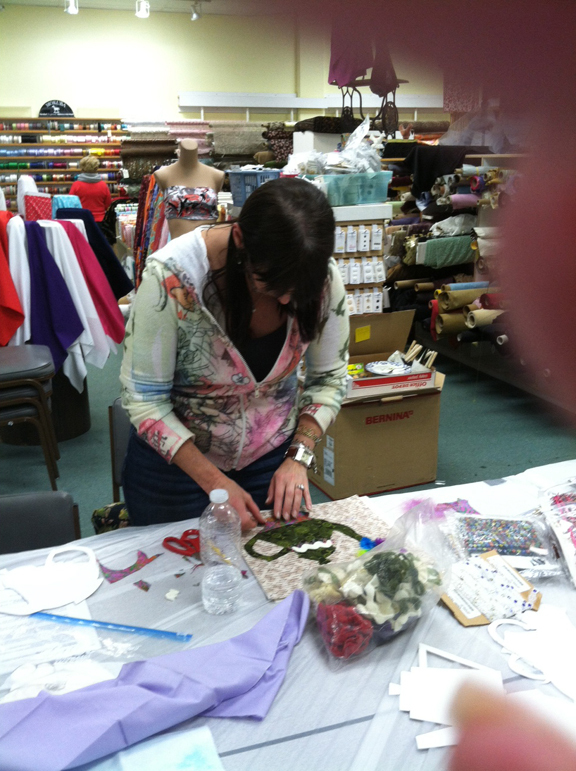 This was an introductory series of 3 sessions at Baron’s Sewing Center in Woodland Hills. 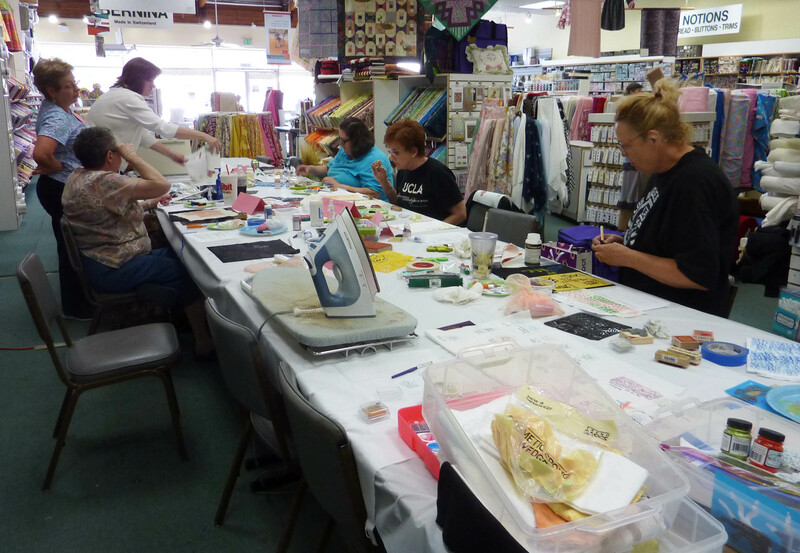 A fourth informal class is planned this week so that the participants can put the final touches on their creations with the instructors on hand for assistance. 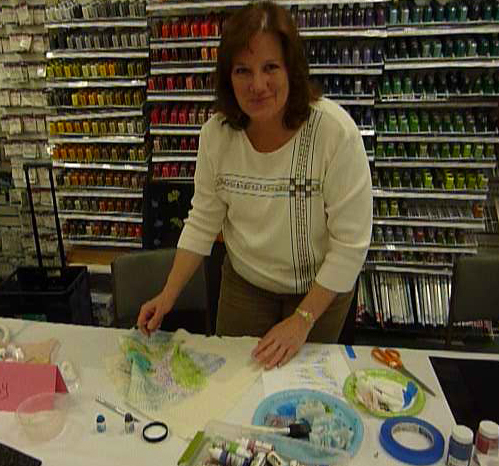 Art quilting encompasses a vast number and variety of techniques that are both fun to learn and valuable tools to have when planning a new piece. With limited time available it was a daunting task to select only a few of them. We did so with emphasis on straightforward versatile techniques. We also presented methods that were fun to do and that used products that wouldn’t be too difficult to find. 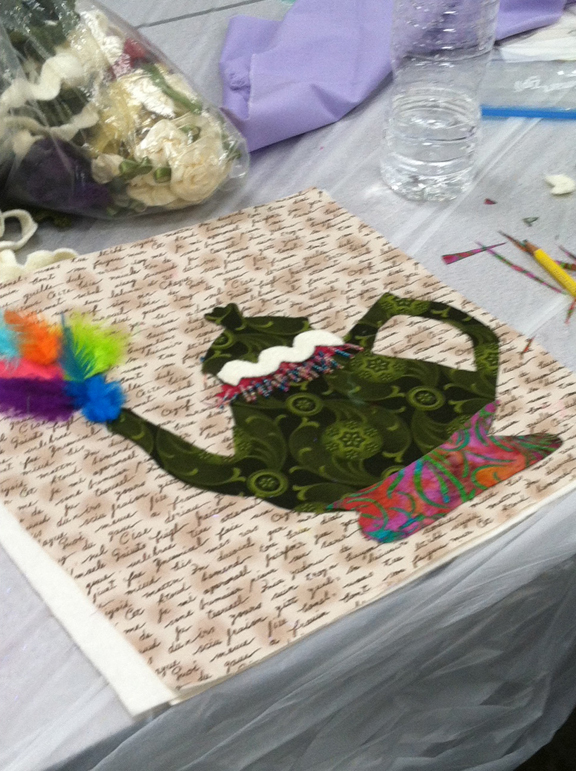 The focus was on technique but each participant was encouraged to put together a piece that would incorporate these newly learned skills. We focused on preparing backgrounds; either as a first layer for additional embellishments or to serve as the composition itself. 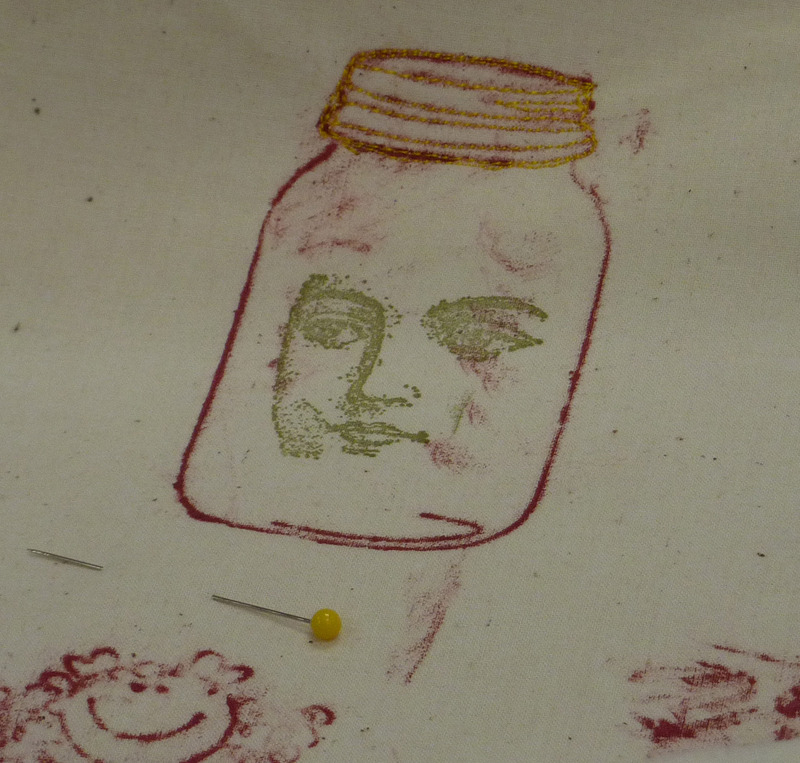 We introduced a variety of ways to get paint onto your quilt: using fluid acrylic paints and solid oil sticks, the group practiced applications using rubbings, stencils and stamps. 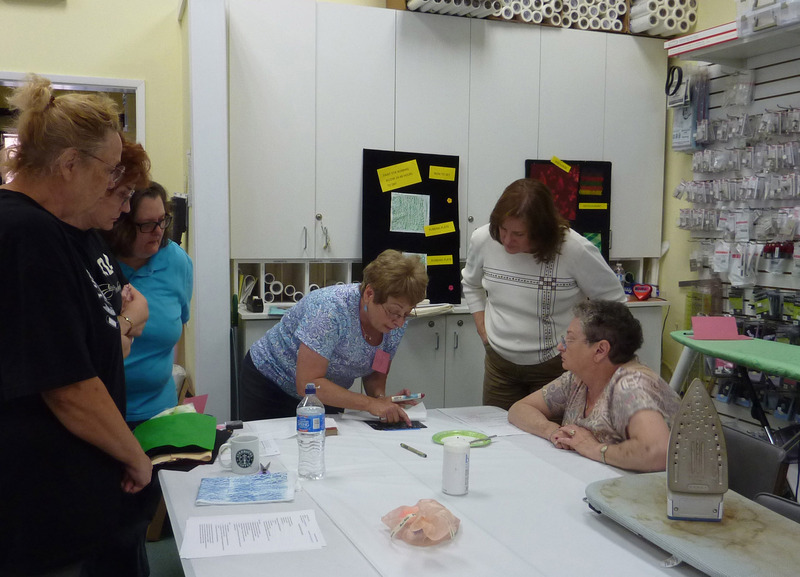 We also discussed and demonstrated Discharge Techniques- various ways of removing color from fabric. These included household bleach and discharge pastes – plain and with color added. When we got to the “hands on” part of the class, they all took off like a shot – full of enthusiasm and creative ideas It’s unusual to see an entire group just take off and run with their new knowledge the way these women did. We all had a blast. We turned our attention to preparing the quilts for quilting. A very important part occurs before your first stitch and we introduced the topic of thread selection, determining function and style and so on. 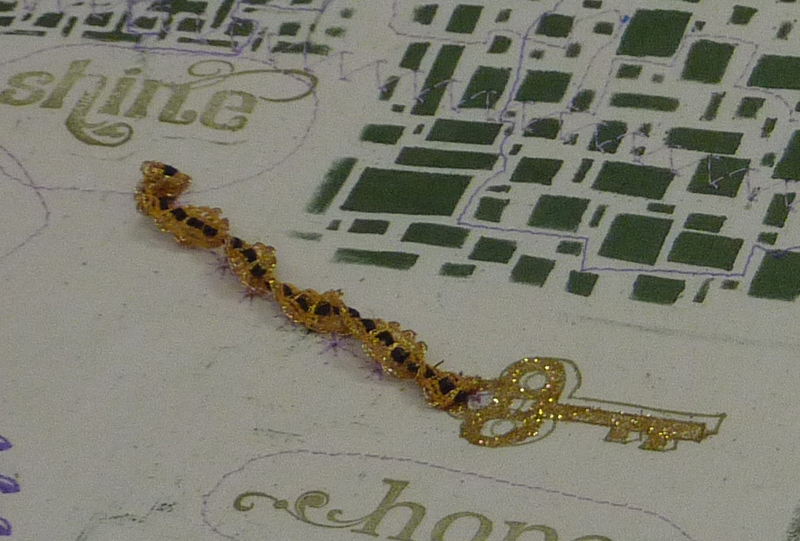 During this session we also started our discussion of embellishment techniques. 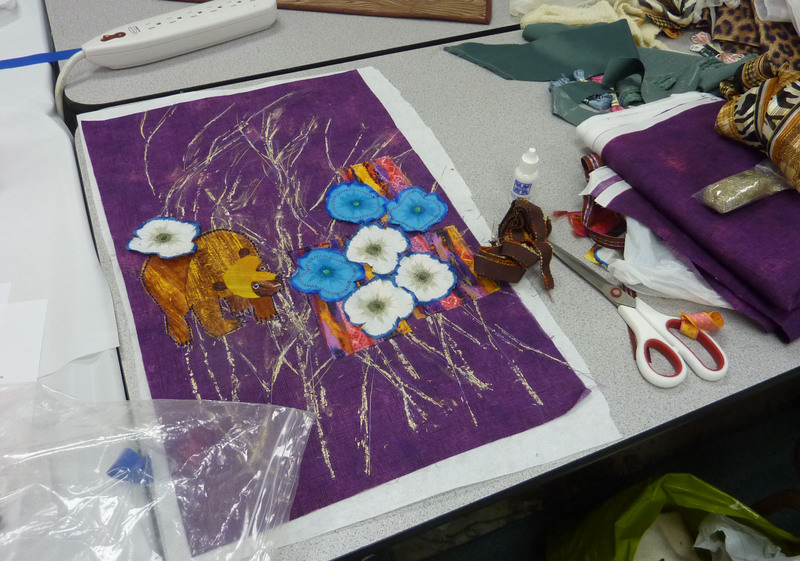 We focused on fusible appliqué and methods of securing these design elements. 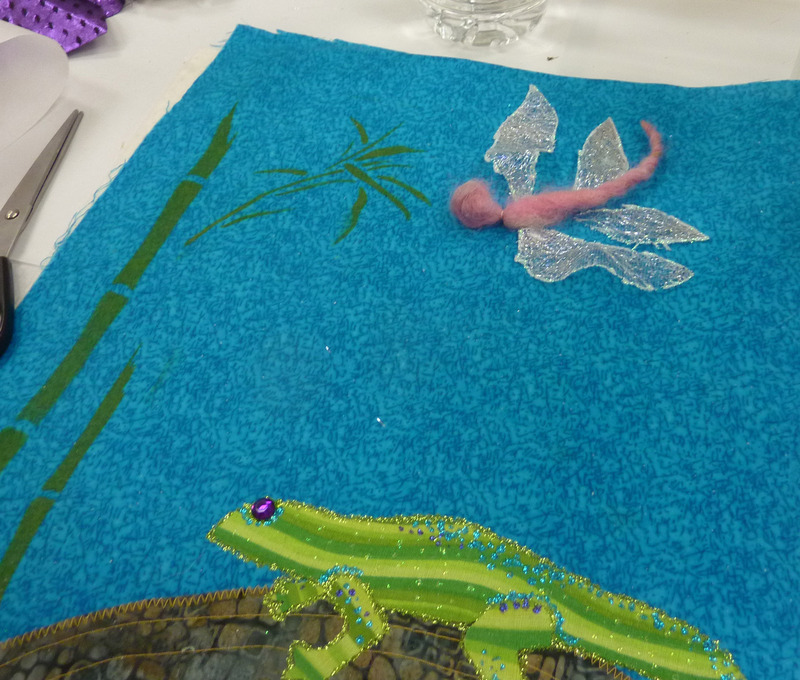 The students also learned how to use foil as a highlighting embellishment – using glue, fusible sheets or a powdered fusible called BoNash to transfer the foil to the fabric surface. A lot of additional designing went on during the week 2 workshop and both Betsy and I worked closely one on one with the students to help them through their design decisions and implementation. 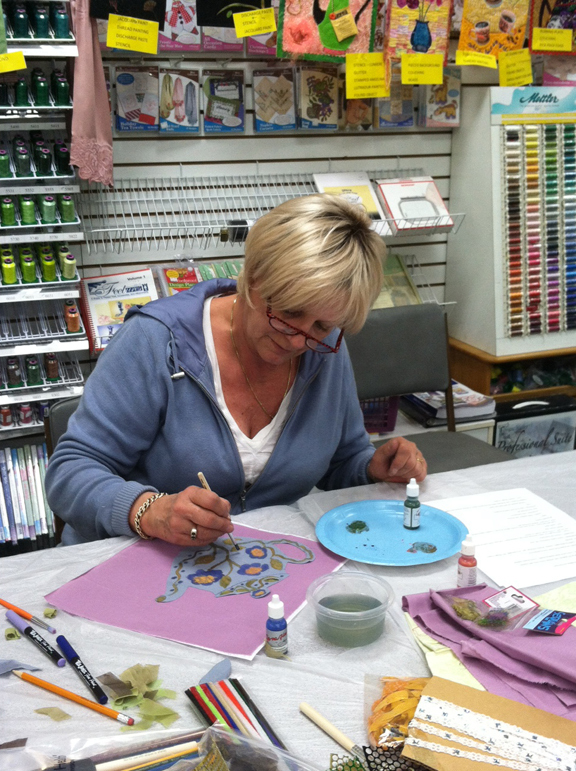 Time to add a little glitz and glamor to our art quilts. We discussed beautiful sparkly Angelina – how to use it, stamp it, apply it to the quilt surface and much more. Wow, exciting stuff to stir up your imagination! Hey, Look What I Just Made! 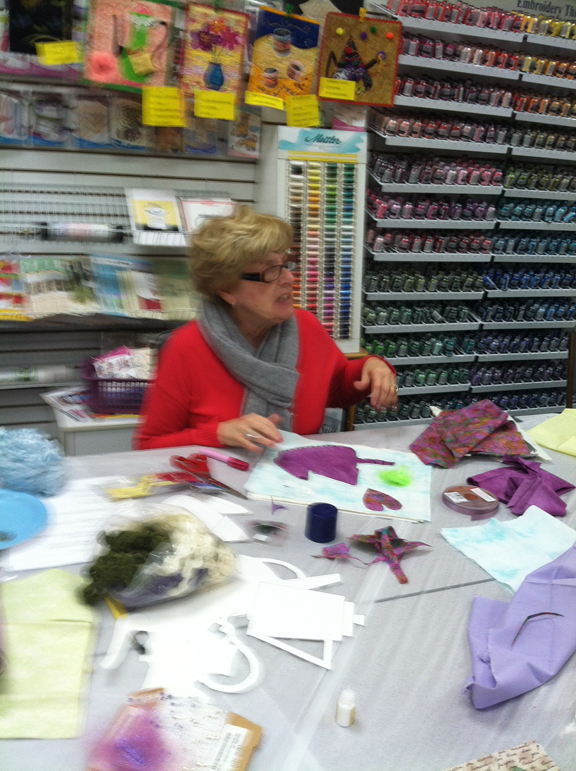 We also talked about and demo’d the use of glitter in your quilt. Talk about your sparkle opportunity. The little art quilts, well under way, needed to eventually be finished. So we went over various ways to finish the ‘edges’ of the quilts and various methods of applying the ‘false’ back to the quilt. During these classes the quilting and embellishments were done with the following quilt layers in place: top, stabilizer, batting, muslin. Then, later a more pleasing/interesting fabric backing was added. We will be putting the final touches on the quilts this next Wednesday morning. 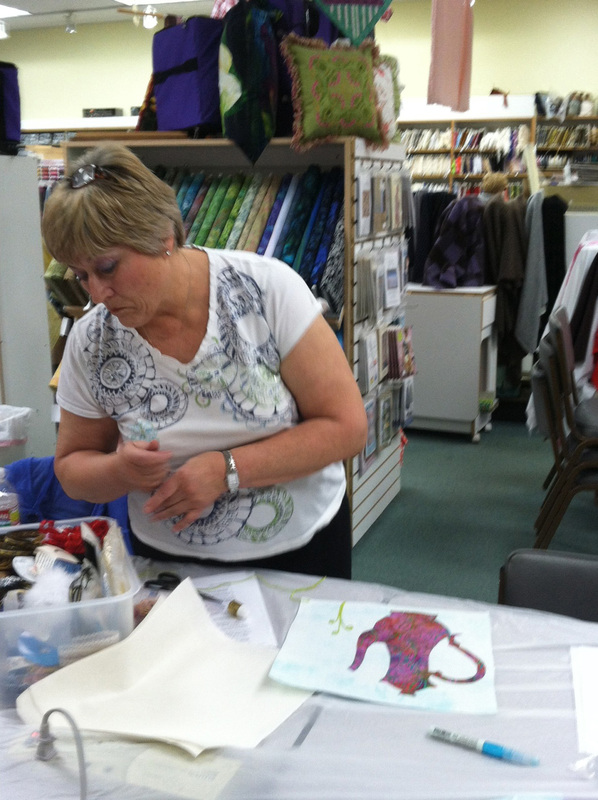 **And we are all looking forward to diving further into the art quilting world this summer. 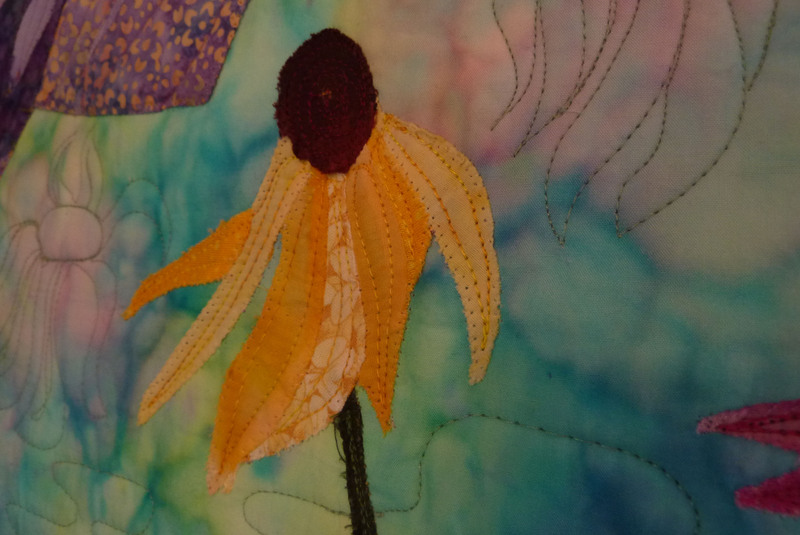 The highly anticipated Art Quilt Camp for Quilters will be held from July 16 through July 20 from 10 AM until 5 PM each day. Sign up now to reserve your spot! My co-conspirator (Betsy Farwell) and I had all our props lined up and plenty of information to share with this budding group of quilt artists. Several of the assembled had never been involved in art quilting at all. 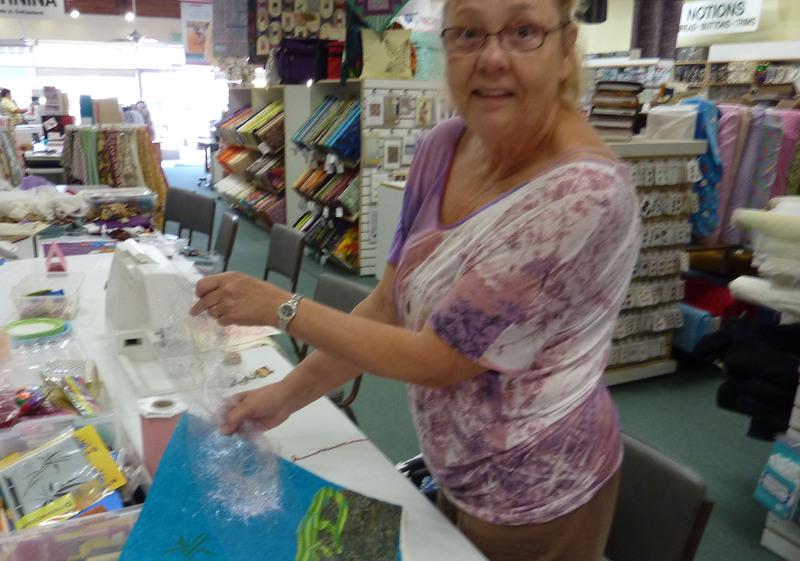 Our goal was to introduce them to some of the basic concepts and techniques of art quilting. Traditional quilting is filled with ‘rules’ and exact measurements. 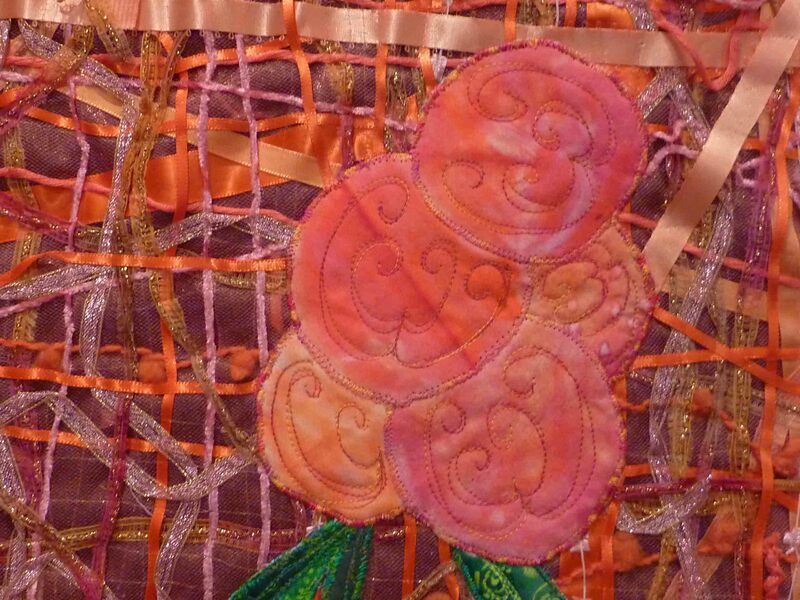 Art quilting is all about creativity and throwing away the rulebook. 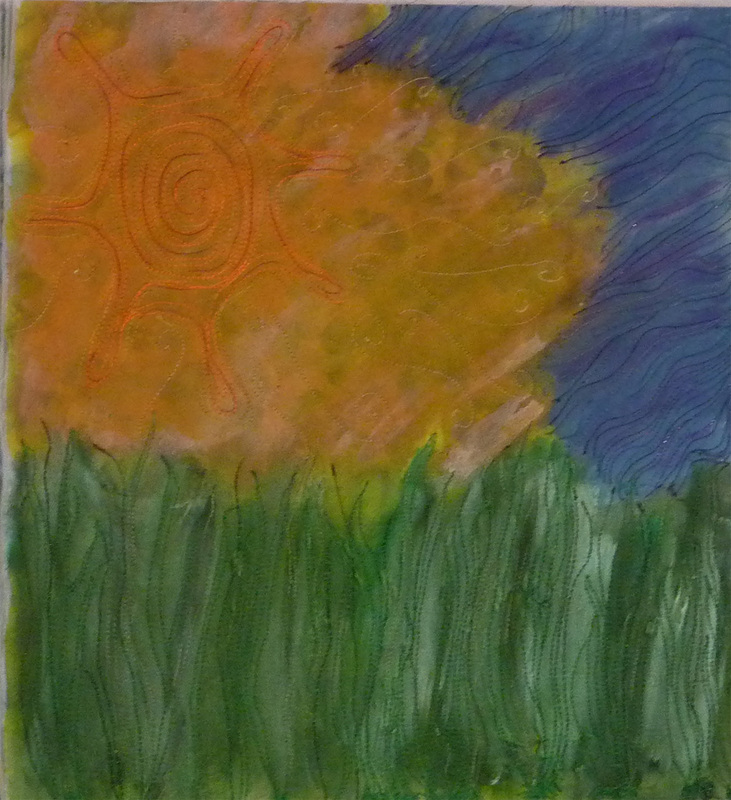 Several participants were a little anxious because they didn’t consider themselves to be “artists”. We aimed to get across the idea that there are many ways to be an artist – that being able to draw well is a great skill to have but it is only one of many. 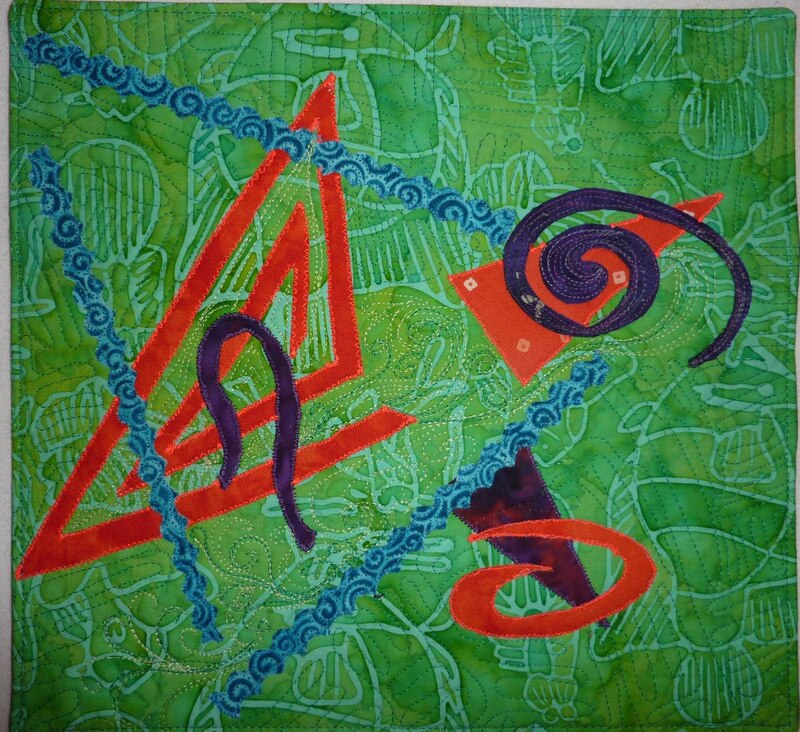 The first prerequisite to being an art quilter is a willingness to experiment and to let your creative mode loose. It is not even necessary to have quilting experience. 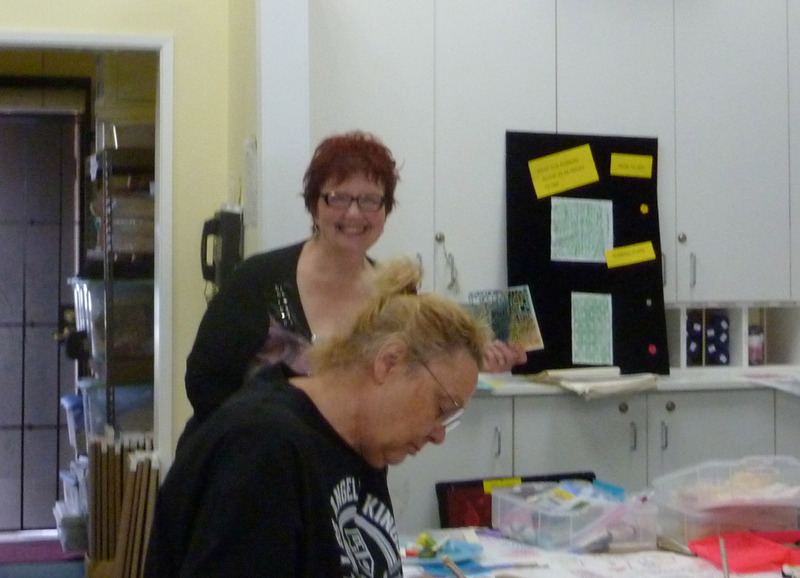 Many art quilters came to the field from general art backgrounds; some jumped immediately to art quilting after just a brief intro to quilting. Our major task was to decide which of the many techniques of dozens and dozens to highlight and to demonstrate. 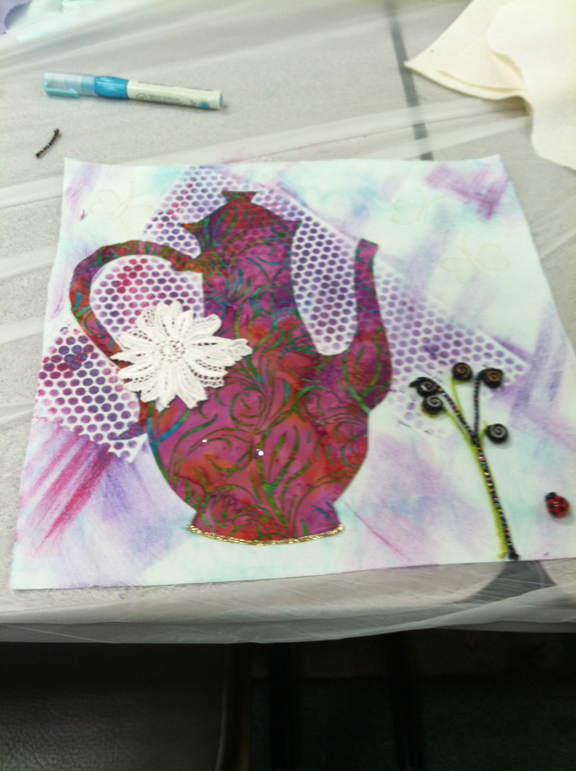 We ended up with a smattering of surface design techniques such as fabric painting with Shiva paintstiks and Acrylic paint and use of rubbing plates, stencils and stamps. We also introduced the group to various methods of fabric discharge. To add a little glitz and glamor we demonstrated use of foil and Angelina embellishment. We had available a potpourri of fun tidbits that they could use as they wished on their creations. There was limited time for the group to play and try out all these techniques. But we turned them loose and play they did! To save time we provided some of our own teapot patterns. 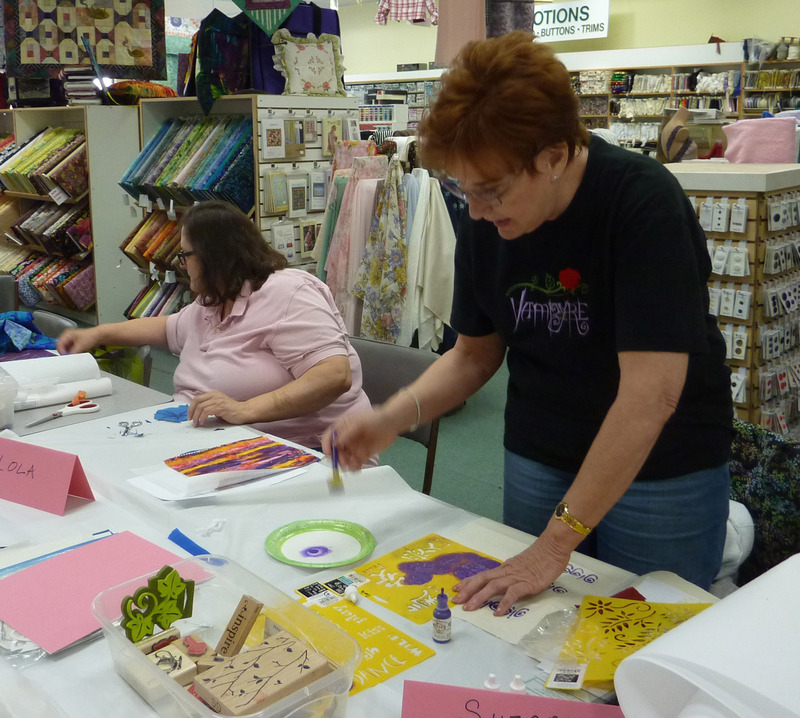 It was so much fun to see the group go off in their own directions to create their unique quilts. And here is some of their work in progress. Please excuse if you see this more than once. I’ve cross posted it to the Quilt Art list and on my Facebook page as well. I have a logistics/design issue that I’ve been working on and am not happy with my solutions so far. I’m SURE there must be one or more of you out there who has happily solved this. I have more than a dozen small quilts that vary in size with the largest about 12 x 12. They do not have a cohesive theme of any kind. I would like to put them all into book form for viewing – but want it to be fairly easy to remove them and of course not damage them in any way. I do not want to put them into ‘jackets’. I have looked at several tutorials and patterns and everything I see is related to making a cover for an existing journal or sewing/quilting a journal. Some of these are extraordinarily beautiful but not what I need. Well, this is primarily a visual arts blog so I’d better do a quick entry and bring you up to date with what’s on my wall. The nice thing about having so many pieces in progress is that I have a variety of styles to work on and will never ever get bored. The bad thing about having so many pieces unfinished is having so many pieces unfinished. I started this awhile back and am in the midst of quilting it. Almost there! I based it on the Hollow Box block by Sara Nephew then designed the overall quilt. Not sure if this would qualify as an art quilt. 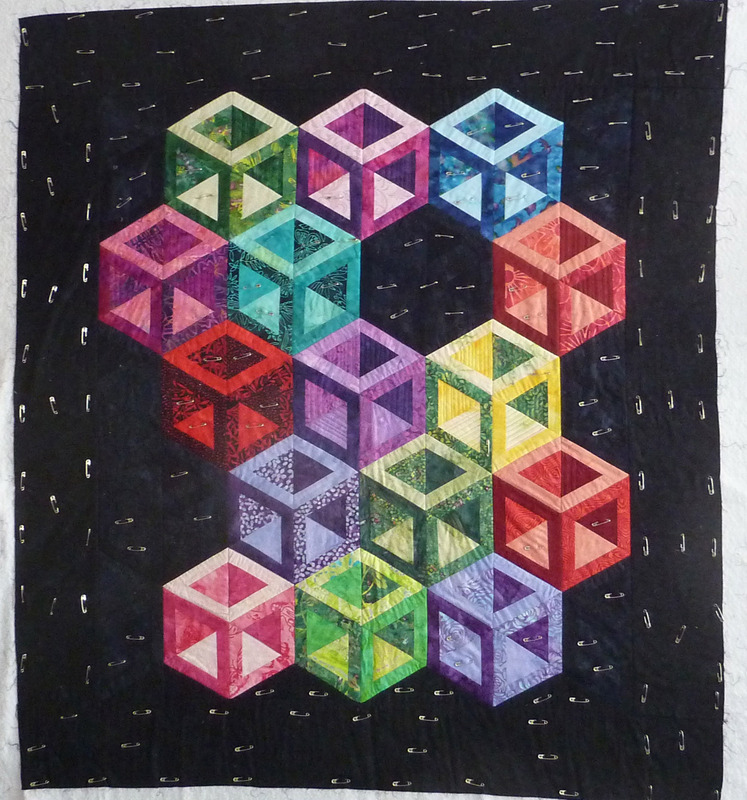 I’d probably call it a contemporary quilt if pressed to pigeonhole it. February has rolled around once more. This year our Haiku prompt word is ‘moon.’ When I get back to the Valley I’ll work on the challenge, writing my haiku based on the prompt and completing a piece of artwork to represent it. In the meantime I’m jotting down some ideas – a stream of consciousness series of associations for the word ‘moon’. 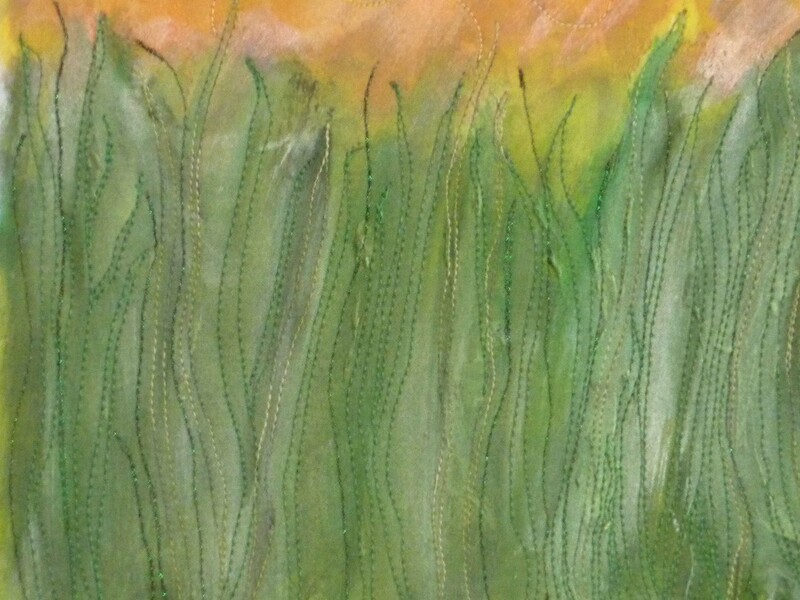 Last year the February prompt word was ‘love.’ With so many new people on board this year I decided to encore the February 2011 haiku and art work. The piece was and is one of my favorites. My goal for the artwork was to illustrate feelings resulting from the loss of love and the subsequent attempts to hide emotions from others. Here you have a heart that has been fractured into many pieces along the faultlines that were there all along. And floating over the pieces of the heart are a tangle of ribbons attempting to hide the tears underneath. All the red “shards” combine to form one complete heart. 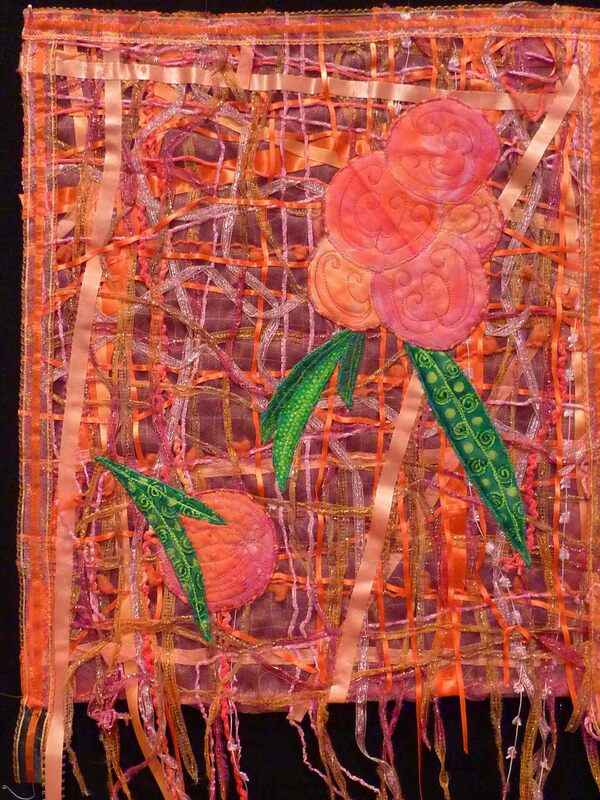 The pieces have been attached to the background with a lot of heavy quilting. I used heavy cotton plus metallic. The ribbons are hand tacked. 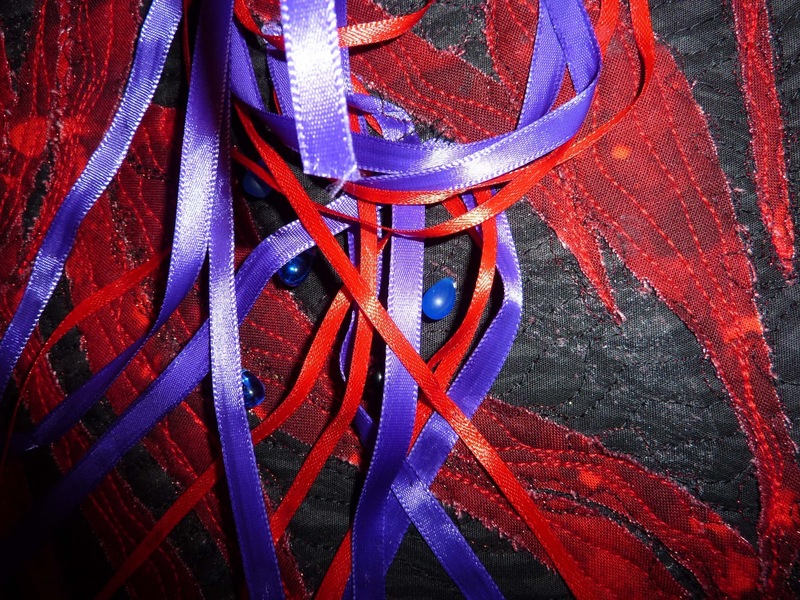 Under the ribbons are tear-shaped beads peeking out. I purposefully left the thread tails and frayed edges alone as they are part of the over all feeling that I wanted to generate. I finally took a photo of this quilt – completed. 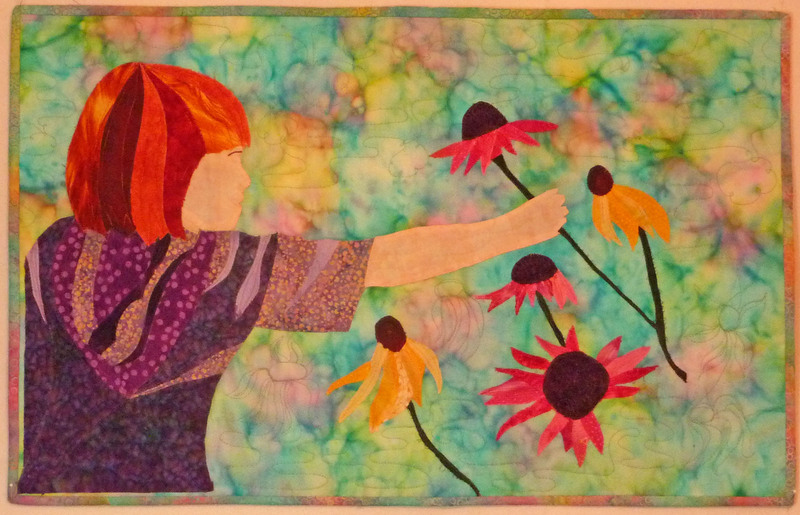 It’s one of my earliest art quilts – 2007 – and it is from a pattern by Wendy Butler Berns. I started this quilt in Wendy’s workshop at the Glendale Quilt Show. She was teaching a technique for turning your favorite photos into art quilts. It was an excellent workshop. This particular design reminds me, of course, of my granddaughters. The little girl in the picture could be either one of them. 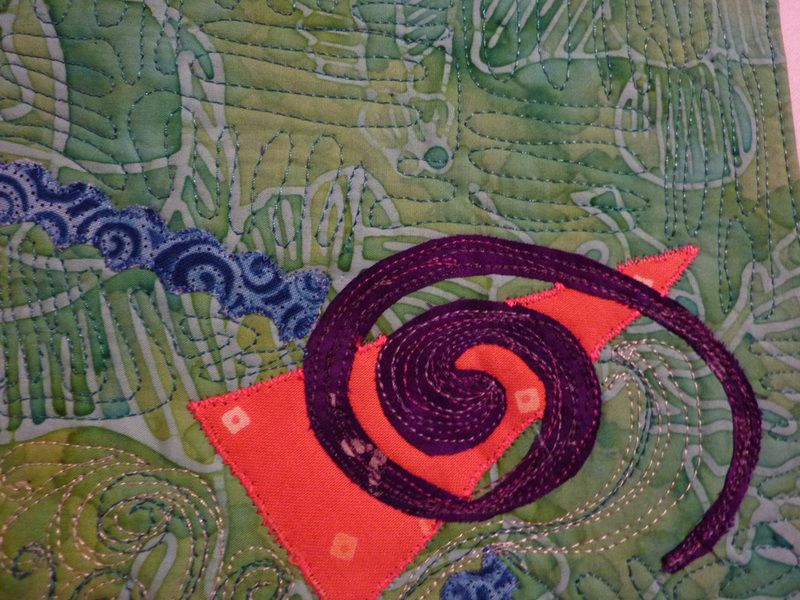 I enjoyed making this – especially selecting the fabrics – and later doing the quilting. It’s a somewhat tedious process but well worth the effort. If you get a chance to take Wendy’s class I recommend it highly. Thanks for visiting ! I’d love to hear your comments. I love doing these journal quilts – what a wonderful way to try new techniques. 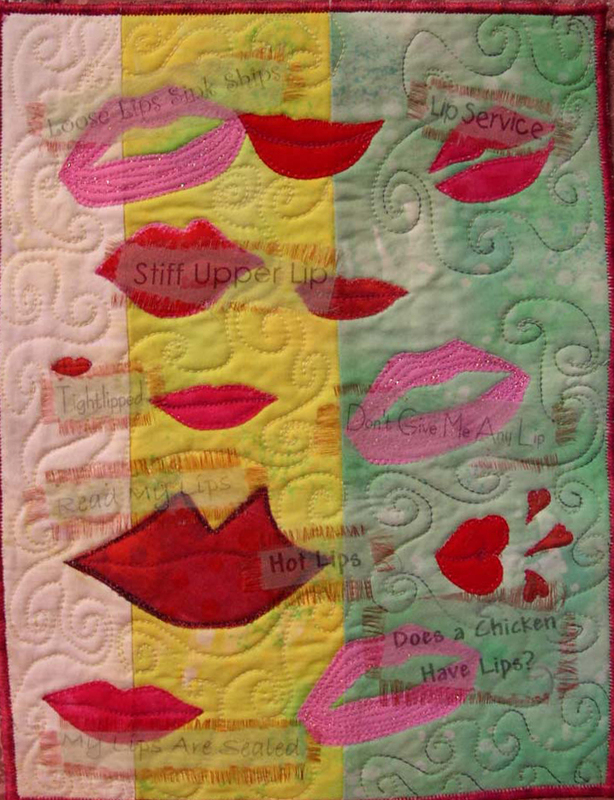 For “I’ve Got Lips” above I first did a pieced background and quilted it. 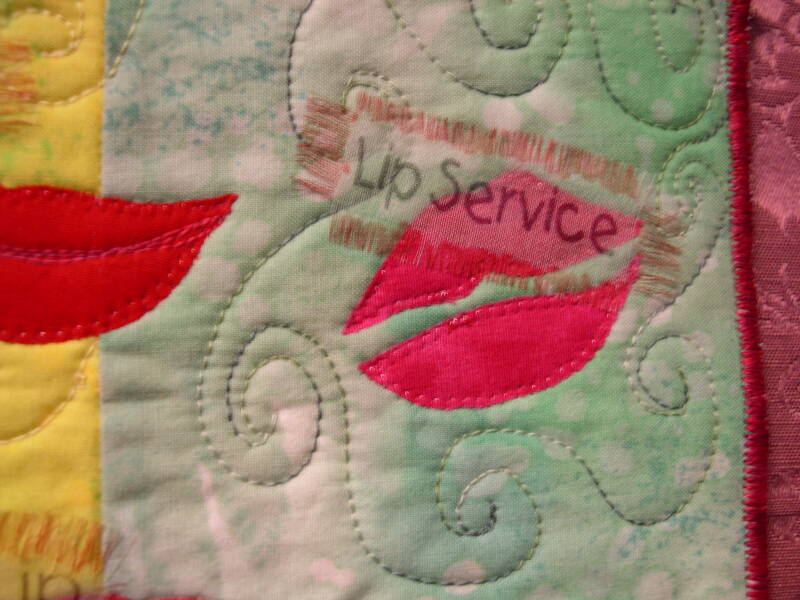 Then I drew and cut out appliques of various “lips” – with a variety of pink and red fabrics. (I had to add paint to get the right color a couple of times) I looked for as many “lip” quotes as I could find and printed them out in various fonts using ExtravOrganza in my inkjet printer. I then cut out the sayings, frayed the edges and painted each one using a fabric marker. I adhered them to the quilt with a clear fabric glue. 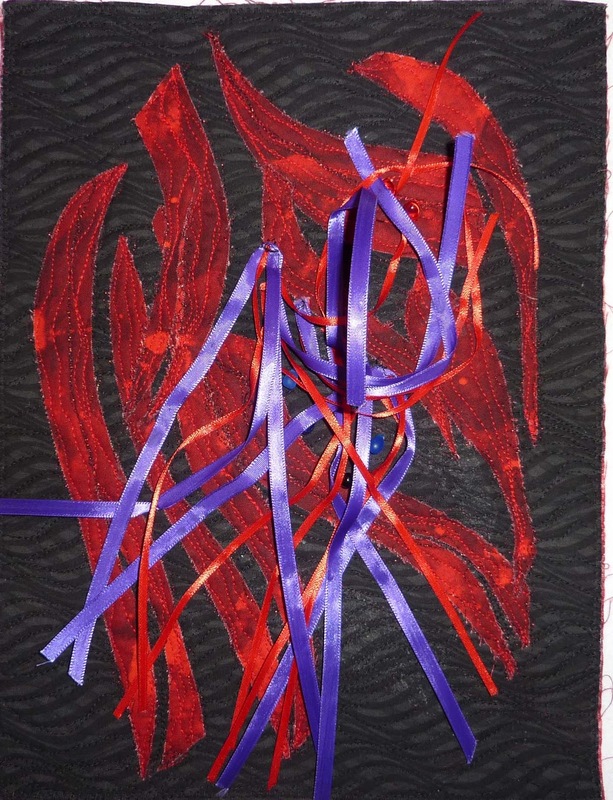 Just about the time we got the Haiku prompt word for September I was itching to do another fiber/ribbon collage quilt. The perfect opportunity arose when we were presented with the word “Rhapsody”. I always think it’s kinda interesting to look at thought processes and how we end up where we end up so I hope you do too. I immediately discarded the obvious (to me at least that was Rhapsody in Blue) and considered “what have I been rhapsodizing about lately?” Peaches!! I had brought home some from Costco and every time I had one I was oohing and aahing about how delicious and perfect it was. AND, just a few days before I had been in the local quilt shop looking at orange and PEACH fabric and carrying on about how gorgeous it was.